A sophisticated instrument with fine attention to detail: an exciting guitar to play. Deft response to subtler, fingerpicking styles. Records like a dream. Decent build from the Godin stable. Despite the brand name, the Simon & Patrick Showcase Rosewood Concert Hall is actually of Godin heritage - part of the same stable as Seagull. "This Showcase has an understated but undoubted air of the upmarket about it"
This Showcase has an understated but undoubted air of the upmarket about it. The rosewood body is bound and purfled in solid woods; there's the always-classy slotted headstock with its open-gear vintage-style tuners; ebony and maple layered veneer facing; and mother-of-pearl inlaid logo. The finish is a serious high gloss, beautifully emphasising the rosewood's figure. It shares compound curve spruce top and the integrated set neck, but the neck is quite different in profile, more of a shallow 'U'. The string at the nut is a fairly slim 43.3mm - the masculine half of this writing duo, with his chunky digits, found this more of a problem, but everything sat happily for the feminine half. All the more reason to try before you buy. Everything about the Simon & Patrick has a refined quality and that certainly applies to its sound. It's rounder, rich and invitingly dynamic. This S&P even keeps a healthy amount of strength in the lower mids and stays punchy when you lean into it with some heavier strumming. "This guitar is refreshing and stimulating to play, harking back to some classic early instruments"
Gentle fingerpicking, especially with nails or fingerpicks, showcases the resonant qualities of that top, too. This guitar is a dream to record: it sounds enormous and placing it in a mix is a breeze, because there's no booming low end. This model is fitted with a B-Band A6T pickup system with onboard chromatic tuner as standard. It's a sophisticated setup with an under-saddle pickup plus a soundboard sensor and a fader to mix the two. A three-band EQ sits alongside a feedback-busting notch filter and phase switch. It's a highly versatile, stage-ready system. 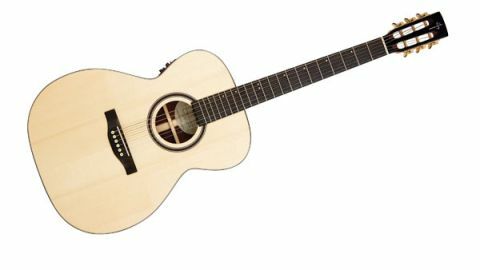 The OM-style Concert Hall bodies certainly have some of the petite 'small body' appeal you get in a parlour guitar, but with a much broader sound. As always, try before you buy, but you won't go far wrong with this instrument.